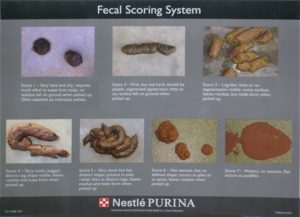 Monitoring Your Dogs Poop & Why it is Important! Scooping up your dog’s poop is not only important for the environment (and for helping you avoid issues with your neighbors) but it gives you a direct insight into your dog’s health and happiness. Listed here are a number of things you can learn from your dog’s bathroom habits. For a healthy dog, poop should be chocolate brown in color, easy to pick up, and slightly squishable. If the poop varies too much from this ideal, one culprit could be inappropriate food portions or content. For instance, a dog that is fed too much calcium in a raw or home cooked diet will have white or gray poop. Green poop can mean your dog is eating an excessive amount of grass (possibly due to an upset stomach), while yellow poop could indicate a diet that is too high in fat. Greasy stools can be a problem for pet owners that feed their dogs too much coconut oil on a daily basis, or an otherwise fatty diet. Additionally, food particles in your dog’s stool indicates poor digestion, while diarrhea (particularly after a change in dog food) can indicate a sensitivity or allergy towards an ingredient. Whether your dog is allergic to an ingredient in his or her food or the pollen outdoors, allergies can show up in your dog’s feces. For instance, if your dog’s poop contains mucous or is loose and watery, inflammation in the GI tract may be to blame. If you recently changed your dog’s food, consider whether this switch may be causing the problem. Otherwise, a change in season or a new environment may be causing this problem. Perhaps one of the most important things that your dog’s poop can tell you is whether your pet has parasites. While most veterinarians require a stool exam at your dog’s annual check up for this very reason, there are certain parasites that can be seen with the naked eye by a pet owner. For instance, tapeworm can appear as grains of rice in dog poop, while black or tarry stools can indicate bleeding in the GI tract caused by worms (or worse). Of course, there are additional reasons that a dog may develop diarrhea or constipation. Dogs that are chronically anxious or aggressive tend to have harder stools and become constipated more easily. However, situations that might induce anxiety in an otherwise calm dog, such as fireworks or a sudden change in routine, are most likely to cause diarrhea and loose stools. Ultimately, your dog’s poop is one of the best indications of his or her health and well-being. A normal dog should poop 1 – 3 times per day. If a dog regularly goes 24 hours without pooping, this situation should be considered abnormal and a veterinarian should evaluate your pet. Alternatively, if your dog frequently has diarrhea or loose stools, a stool sample should be brought to your veterinarian to check for parasites and to also discuss your dog’s diet. The ideal dog poop you should see is number 2 in the chart with also number 1 & 3 acceptable. If you are seeing any other types of poop on more than one occasion you need to seek a remedy for your pups stool. A pup doesn’t enjoy having to produce a stool #4 through #7 so it’s your job as the guardian to seek a solution and work towards a poop of a score of 2. Always keep an eye on your pups poop as it’s the key to their health! If in doubt bring a sample to your vet for analysis.